Bill Hartzer caused a stir last week when he published this post asking Was Godaddy Caught Registering Domains Names After Availability Lookup? based on Zen Savona’s Why You Should Never Use GoDaddy Again. This isn’t the first – nor will it be the last – time that a domain registrar and specifically GoDaddy is accused of grabbing up domains you search on so you have to register them through that registrar rather than shop around. All the way back in 2008 this Webmaster World Forum thread shares that Network Solutions solution to Front Running is Front Running. That issue hit CNET: Registrar denies ‘front-running’ Net registration. Network Solutions was strongly criticized in 2008 when they revealed they registered every domain searched for and that news spread widely with one of the better Network Solutions Front Running investigations published on DomainNameNews. of front running. The question is “protecting” from whom? There is no shortage of of comments on this issue as it has been asked online for years – some say as far back as 1999 – and discussed on sites like Quora: Will godaddy.com book a domain if it is searched but not booked? Whether registrars do or do not grab the domains we search on, one thing is for sure. You can avoid that issue by immediately registering the domain name right away – maybe even leave that one open in one tab while you make up your mind or search for others. While GoDaddy may be the best known, thanks to their controversial commercials featuring barely dressed women, many are still moving their domains away from GoDaddy because of their support for SOPA exposed in a huge GoDaddy boycott called by Reddit that forced GoDaddy to retract SOPA support. to move over 82,000 domain names from GoDaddy over the boycott period. There are many domain registrars and domain registration resellers, so you should shop around. 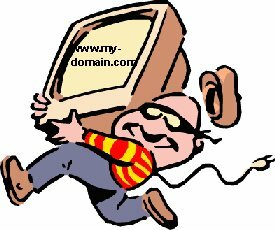 Sometimes one kind of domain (.com versus .org or a country code) is on sale on one registrar and can cost many times more on another. LinuxHostingOnly ~ Has .org domains on sale for $6.99 as we write this. Note that if you want domain names ending in country codes you’ll need to search to find our which can be registered by what registrar. Some are not available at all and others are only registered through a single source. If you want to know more about domain names watch for future posts in the domain names category. Have you been the victim of a domain runner? Do you have a favorite domain registrar? Tell us in the comments. I used GoDaddy for domain registration for quite a few years but dropped it after the one-two punch of a negative hosting experience and the company’s support of SOPA. I finished moving my remaining domains off the service about a month ago (I was one of those who didn’t move the domains until they were nearing renewal). However, I’ve never ran into any problems with the company front running domains. Thanks for commenting. We are definitely not in favor of SOPA, PIPA, CISPA or any other reincarnation that would take away the Internet as we know it. We HAVE heard many say that GoDaddy hosting leaves a lot to be desired, but those same bloggers used to register their domains through them and some still do. I find their commercials offensive and the only domain I ever had registered with them was registered by my Web developer on my behalf. I moved it during the GoDaddy SOPA boycott.